The unicorn of doughnuts. At first bite, you will be saying, “it’s so fluffy! !” Festively flavored, airy, and topped with sweet and spicy gingerbread icing. Get the flour ready and break out the yeast, we’re making fluffy unicorn dreams come true with these Fluffy Baked Gingerbread Doughnuts. 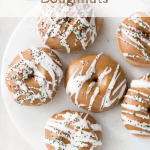 I go back and forth whether my favorite part about these doughnuts is that they are ridiculously light and fluffy…or that these bad boys go in the oven not the fryer….or maybe the sweet and spicy gingerbread glaze that coats them. Ahh, my head might explode just trying to decide. Really, all you’re doing is making a nice, warm, happy environment for the yeast to thrive in. Getting the milk warm, but not too warm is the key. Yeast thrive in warm but if it’s too warm you will kill the yeast. Don’t be a murderer, just invest in a candy thermometer. Like this Candy Thermometer here. It has a clip and is under $10. 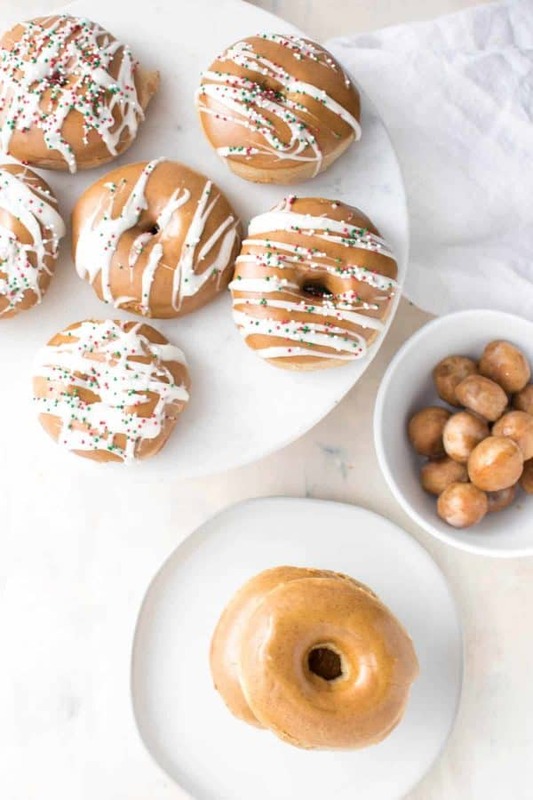 Now that you are the proud owner of a candy thermometer you can make things like Buttercrunch Toffee and Penuche Fudge in addition to these Fluffy Baked Gingerbread Doughnuts. That just sounds like a whole lot of #winning to me. Warm milk + sugar. The warm milk is the environment and the sugar is the food. Sugar for yeast is like an all you can eat buffet when you’re so hangry you can’t even stand yourself. Eat up my little yeasties. After the flour and spices and mixing, you just chill and let the yeast do it’s job. That’s really all there is too it. That wasn’t so scary, right? 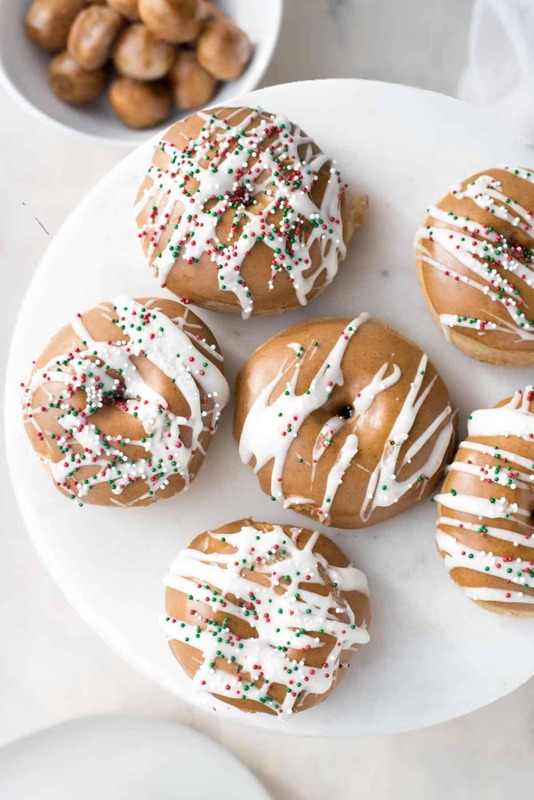 If you’re planning on making these fluffy baked gingerbread doughnuts for Christmas morning (which I would highly recommend) prep the dough the night before then roll out and cut in the morning. Then the cutout doughnuts can rest while the unwrapping of Santa’s goodies commences. A quick trip to a 400°F oven for 8 minutes and your family will be ooo-ing and aah-ing at your culinary delights and gift giving abilities. While these doughnuts can be fried instead of baked, why would we if we don’t have to? I mean, there’s a lot of fried stuff I’ll eat, but if its just as airy, fluffy, flaky good without saturating it in oil…well, imma gonna do that. Unlike most baked doughnuts these Fluffy Baked Gingerbread Doughnuts have the airy texture of a regular fried glazed doughnut you might get at a coffee shop. I’m looking at you Dunkins. Most baked doughnuts are made in a pan with a cake like batter. Still delicious, but not the texture we want. We want these to be as soft and light as the clouds Santa is flying his sleigh through whilst we dream the night away. You can purchase this 3-1/2 inch doughnut cutter here . Tip: When cutting the doughnuts, try not to wiggle the cutter too much. This will prevent the dough from getting a full rise during the pre-baking rest. They still rise, but not to their full potential. Like the bow on top of the present, the star on top of the tree, these fluffy baked gingerbread doughnuts aren’t complete without it. The icing packs that gingerbread flavor so reminiscent of the cookies we love. Sweet molasses, spicy ginger, warm cinnamon. 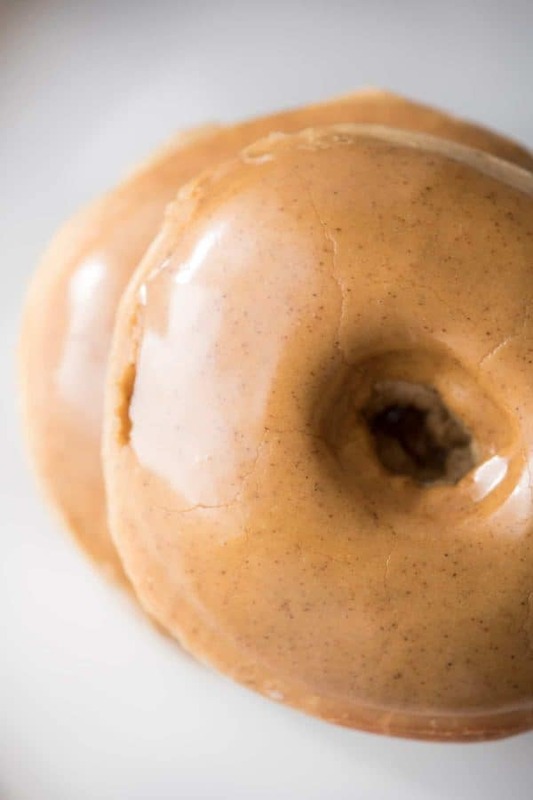 It’s like a hug of flavor for our mouths and the doughnuts. The easiest way to do this is to put together the icing while your doughnuts are resting, pre-bake. Then when the doughnuts are fresh out of the oven, and just cool enough to handle but still warm, dip into the glaze. Whether you trash it up with drizzles and sprinkles, that’s on you. But when it comes to frosting and sprinkles, I don’t know, I tend to let my inner Clark Griswold come out. 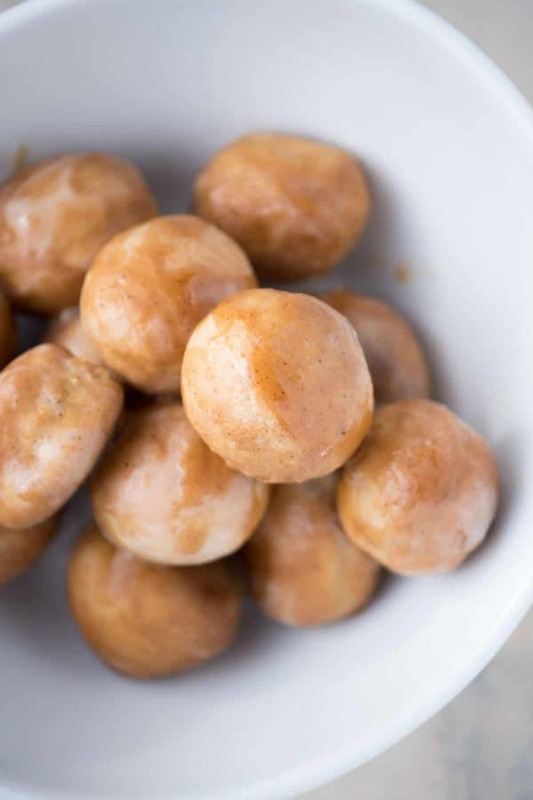 As for the doughnut holes, don’t toss these babies aside! Like little burst of holiday cheer, they’re great to have as a pre-breakfast munch or serve with coffee after dinner for a nice little sweet treat! Just toss the warm doughnut holes with the leftover glaze and call it a day. This post contains affiliate links. The price you pay at the checkout does not change, but I make a small commission from the sale. Thank you for supporting Hunger|Thirst|Play! Airy inside and golden outside, laced with spicy ginger, warm cinnamon and sweet molasses. These Fluffy, Baked Gingerbread Doughnuts are the perfect addition to your holiday breakfast. In a small saucepan, heat milk over low heat to 110°F. A candy thermometer will work great to temp this. If you don’t have a thermometer, the milk should be warm enough you can hold your finger in it for at least 30 seconds. If the milk is too warm it will kill the yeast. Transfer the milk to a standing mixer fitting with bread hook attachment. Add sugar and yeast, mix to dissolve sugar, about 1 minute. Let rest, without mixing, for 5 minutes. Turn the mixer to low and add the beaten eggs and melted butter. While mixer is running on low, add the spices, molasses, and salt. Slowly add the flour, working in 2 to 3 batches is the easiest. Once all the flour is added, increase mixer speed to medium low to incorporate ingredients, 1 minute. The dough should be sticky to the touch, but most of the dough should pull away from the sides of the mixing bowl. Return speed to low and mix for a full 5 minutes. Let the dough rest in the bowl for 10 minutes. After resting, transfer the dough to a lightly greased bowl, scraping the dough from the bottom of the bowl if needed. Cover with plastic wrap and refrigerate for at least 8 hours or overnight. Cutting the doughnuts: Transfer the dough to a flat work surface lightly sprinkled with flour. Roll out dough to 1/2 to 1/3 inch thickness. 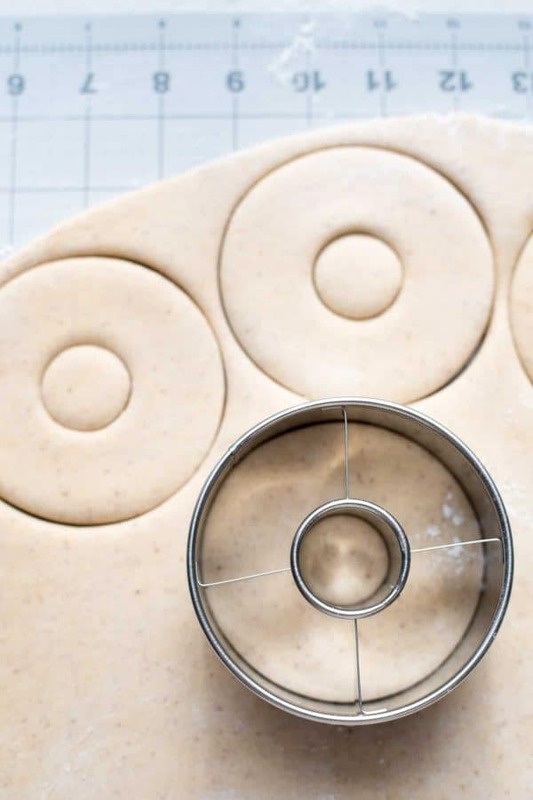 Cut out doughnuts using a 3-1/2 inch doughnut cutter. 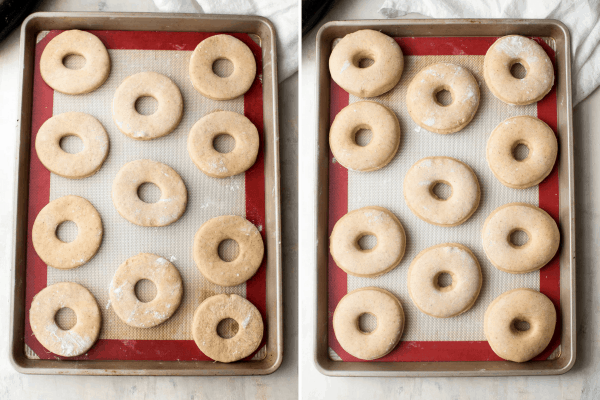 Transfer doughnuts to a sheet pan lined with a silpat mat or parchment paper. Doughnut holes should be transferred to a separate sheet pan, as they will cook faster. Form the left over scraps into a ball, kneading if necessary, and repeat the roll out and cut out process as many times until all the dough is used. Transfer the baking sheets to the oven. Bake full doughnuts for 8 to 10 minutes. They should be golden on top and on the bottom. Bake doughnut holes for 5 minutes. Let doughnuts rest for 5 minutes, or until just cool enough to handle, and dip into glaze while still hot. While the doughnuts are resting, prepare the glaze. In a medium sized bowl, combine confectioners sugar, heavy cream, molasses and spices. Whisk or stir together until smooth. The icing should be thick. Icing the doughnuts:. With the doughnuts fresh out of the oven, dip into the glaze. Dip the doughnut top side down and gently press into the glaze. Give it a turn before gently removing. Place on a sheet pan or parchment paper to let icing set. If you wish to use sprinkles, apply or dip while the icing is still wet. If the doughnuts have cooled too much, heat the icing for 10 seconds in the microwave to thin it. Note: the white icing in the photos is a thinner version of the glaze using just confectioners sugar and heavy cream, drizzled over the doughnuts after the gingerbread icing is set. 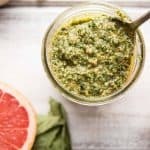 ¹Spooned and leveled – scooping the flour with a small spoon into the measuring cup and leveling off is a common method for baking because in the United States we hate the metric system. If this sounds like too much of an extra step, go on with your usual scoop methods but cut out the last ¼ cup and just use 4 cups of flour. Side note: These doughnuts are equally delicious if you substitute half the all purpose flour for whole wheat flour. ²Yeast loves warmth. During the hour of resting I preheat my oven with the sheet pans on or near the stove top. The heat from the preheating oven will help get the doughnuts to rise as much as possible. Also, if your house or apartment is generally pretty cold, this will help too. What if I don’t have a standing mixer? You can still have doughnuts! Prepare the doughnuts following the same directions but instead of using a bread hook, you’ll be using a spatula to help work out the dough. 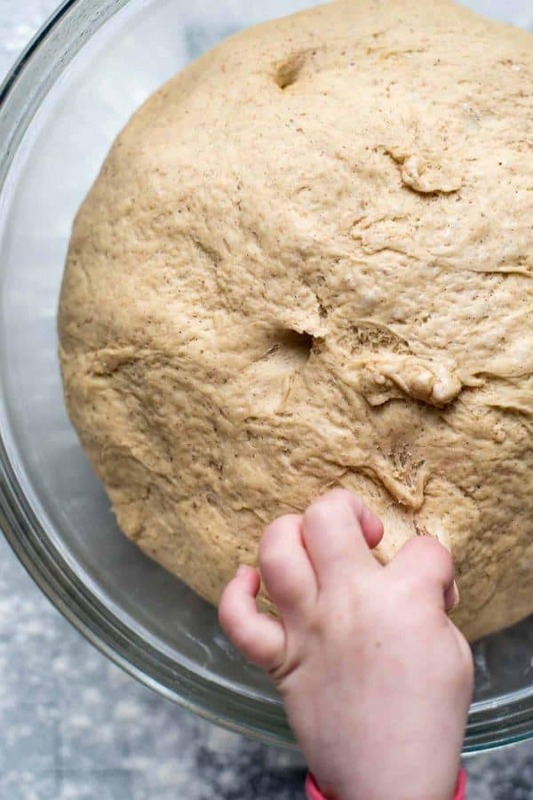 You can also use your hands to help the dough come together, but it will be very sticky so just keep that in mind. I’m such a sucker for gingerbread & donuts! These look delicious! HOLY SMOKES! Those look amazing! I can’t wait to try these! I love baking donuts! 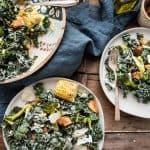 And these sound delish! I can’t think of anything more perfect for Christmas morning! These donuts look incredibly delicious, and I can’t wait to try them! Oh goodness, yes please. These look incredible! Oh my gosh! These are so pretty and festive for Christmas. The look delicious. You have real talent being able to make these from scratch! They look delicious 🙂 I just might dare to try these. My kids would love them! They’re really not that difficult. Its very similar to making sugar cookies but you heat up the milk and have to let the dough rest overnight and then again after cutting! HA! You know my greatest fear: yeast doughnuts. 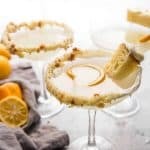 But this recipe might convince me to make them after all! Haha! Not all superheroes wear capes right? I love baked donuts! These look amazing! These are adorable! I’ve made baked donuts, but never with yeast. I bet they’re dangerously close to the fried version. They are but just in fluffiness, they’re not greasy or heavy like a fried doughnut. Since I am a gingerbread fanatic…these sound delicious. What a great treat for the holiday brunches. Thank you! Me too! All the gingerbread things! One of my fondest memories is my mom standing at the stove in our farmhouse, frying up doughnuts fresh! And our Golden Retriever standing at her feet, waiting for doughnut holes to drop. 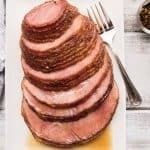 Your recipe sounds amazing and the flavors would be perfect for Christmas morning. Thanks for sharing- from another fellow New England girl! What a lovely memory! I absolutely love that food ties us to memories so much. Where in NE are you?! I love the donut baked in the oven idea! Thanks for sharing a great recipe! 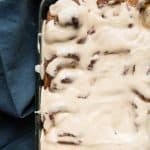 Such a great option for a holiday breakfast and I love that they are baked! Yes! That’s my favorite part too! Oh my word- I’ve never bought a donut mold because I just don’t have room for it, but I bet I could find a space for that donut cutter! These sound amazing! Right? A doughnut cutter doesn’t take up much space ???? These look beyond amazing and I love how simple you make them sound! I’ll have to give these a go soon! I’ve never made homemade donuts!!! And the gingerbread icing sounds delish! The color looks amazing and makes me want to have one right now, especially with the sugar glaze. I would have never guessed from the looks that they are baked and the idea of baked doughnuts is of course better then fried! 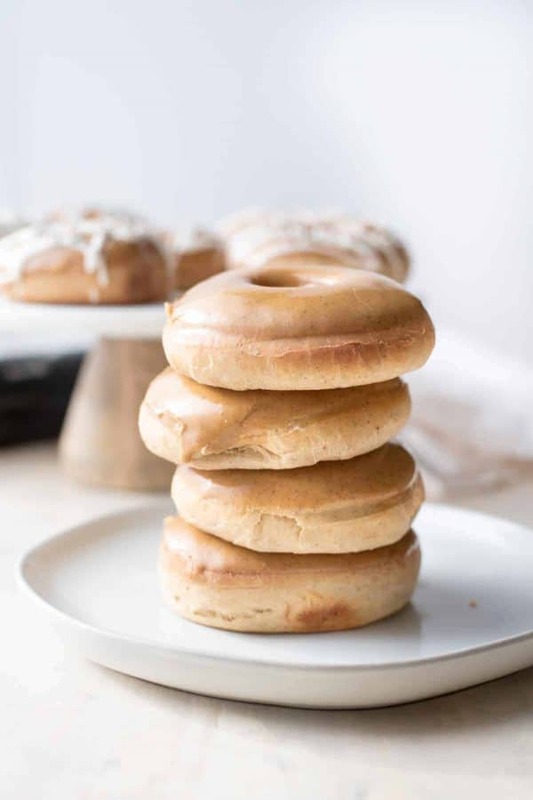 These are so round and fluffy, I thought they were bagels at first. Gorgeous!! 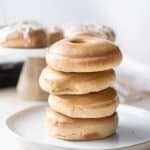 I vastly prefer yeast donuts to cake donuts, so these sound amazing! These look absolutely amazing — so light and fluffy and perfect. And I LOVE that they aren’t made in a donut pan. These donuts look amazing and I think I could probably drink that glaze, it sounds so yummy, lol! I’m all for plain donuts without any sprinkles but my kids would go crazy for the blinged out ones! Oh wow! These look delicious and festive! Oh no! How frustrating! I’m sorry to hear there was trouble with this recipe. I haven’t tried halving the recipe, so I can’t say for sure if that’s the issue, but it does sound like you needed more flour. When the dough is in the mixing bowl, it should be tacky but pull away from the sides of the bowl. Also, you can be liberal with the flour when rolling out the dough so it cuts easily. I hope that helps! Can I put this dough in a donut mould tray? Hi Anna – In my experience, the doughnut pans are more for cake-style doughnuts where the batter is a bit more liquid. This recipe makes a yeast dough so you would have to roll them and cut them out anyways. The constriction of the doughnut pan might also prevent a full second rise.